My mother died in my arms on Wednesday morning, September 10, 2003. She was eighty-three. Afterwards, I searched for a special journal in which to write about her. The one I found was perfect—covered in celadon green velvet with a lovely embossed design on the front. Green was her favorite color. The journal has lived in the bottom drawer of my bedside table for the past nine years. It has one rambling four page entry, written three weeks after her death. The problem was I could never talk to my mom about hard stuff—and anything that was hard for her to hear was “hard stuff.” What I needed to write would be hard for her to hear. I had taken care of my mother all my life—and I couldn’t stop just because she was dead. Born and reared in Georgia, Mama was a Southern woman through and through. Anyone who has seen Gone with the Wind or Steel Magnolias knows contradiction is inherently bred into Southern women. Mama was tough as nails and fragile as gardenia petals. She was strong when she needed to be, and frail when it suited her. My pet name for her was Mumselle. Mama started dying long before she actually did. She died in fits and starts. When she was seventy-three, she had breast cancer. I was with her when she got the news. She looked small and fragile, sitting on the edge of the examination table, shivering in her hospital gown. But she breezed through her lumpectomy and radiation with nary a whimper—as far as anyone knew. A couple years later, Mom tripped and fell in her apartment parking lot. Her arms were full of groceries, so she landed on her face. It was awful. She looked like she had been beaten up. A neighbor called 911 and Mom was taken to the emergency room at St. Francis Hospital. Afterwards, she stayed with me for a week. Whenever the doorbell rang, Mama grinned and threatened to open the door and scream for help. (I inherited her sense of humor!) The giant bump on her forehead never quite went away, and I’ve often wondered how much the fall contributed to the problems she had afterwards. 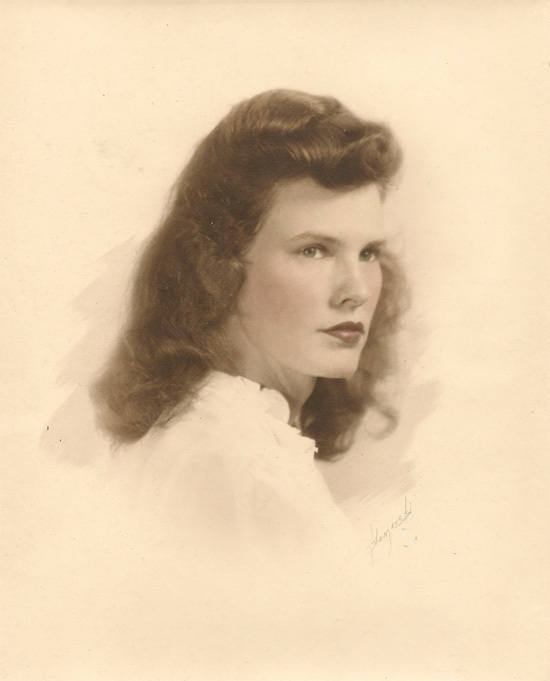 My mother had been a bookkeeper all her life, and worked at the YWCA for eighteen years. Every morning she drove her green Toyota Tercel to the Y then worked from 8 to 5. When Mama was seventy-nine, the Y got a new director whom I will call Christy—because I have no interest in protecting the guilty. Christy was just out of school and determined to make her mark. When Christy was hired, the Y was having financial problems and money was tight. That made Mama nervous—tight money was an old story in her life. Mom was devoted to the Y, and it was taking a toll on her. Anxious by nature, she became even more so. Mom began making mistakes, getting confused. Much later, when I read documentation Christy had kept on Mama’s fall from grace, I doubled up and cried. It quickly became apparent that Mom could no longer handle the stress of the job, and this woman simply wanted her out. There were more “Christian” ways to handle it, but Christy laid the pressure on my mother until she broke. One night, Mama had a dream in which her mother fiercely admonished her, “How many times have I told you NEVER outstay your welcome?” Grandma Emma-Lou was a proud woman. Mama said she woke from that dream, took a shower, and called a meeting. At the meeting Mom told Christy she would resign—only if the Y made it look like she was fired, so she could collect unemployment. Christy agreed. The Y threw her a big party, but Mama felt shamed and bitter at what she forever referred to as her “so-called retirement.” She turned eighty a month later and collected unemployment while diligently filling out job applications. Mama never found another job. Soon after, Mom moved in with her good friend Jean. Jean was also a widow, wanted to keep her house, and didn’t charge Mom much rent. The two shared the house with Jean’s tiny grey dog, Charlie, and Mom’s big orange cat, Jezebel. It seemed like a win-win situation, except Mama hated it. She had loved living alone. Jean was bossy and outspoken, and Mom was passive and quiet. Jean was a “health nut” and cooked broccoli and salmon at least twice a week. Mom was happy with tea and toast. But eventually they settled into a comfortable routine. They went out regularly for breakfast and local plays. Most nights they drank boxed Chablis and dozed off in their recliners watching TV, like an old married couple. That Christmas I made them matching fleece lap-blankets as kind of a joke, but they loved them. In June 2001, when Mama was eighty-one, she tripped on her lap-blanket, fell, and broke her hip. The ambulance took her to St. Francis where she breezed through hip-replacement surgery. One morning, two days after her surgery, I was surprised to find Mom strapped into her bed. The night before, Mama had dreamt that my kids were still babies and she was late picking them up from daycare. The night staff discovered Mama hurrying down the hospital hallway, frantic because she couldn’t find her car keys. The straps were a sleepwalking precaution. After a week of physical therapy, Mom was discharged. She stayed with me and my husband Barry for three weeks, before returning to Jean’s. Once, when the most major of these happened, my brother Joe and niece Ami flew up from Texas. It was dead of winter and freezing cold. We met with Mom’s doctor in a small dark room, where he clipped up x-rays, and showed us pictures of Mom’s arteries. He pointed out the tiny crimps and turns that were causing her speech problems, confusion, and coma-like behavior. At home that night, I looked out the window. Silhouetted against a white-grey sky were the long dark branches of a tree. “Hey, what does that look like?” I asked Joe. The next year was full of so many trips to the ER that I put St. Francis on speed-dial. One day I took Mom to the dentist and during a routine procedure she had palpitations and chest pain, so they called an ambulance. I followed the ambulance and when it turned into St. Francis I had to fight the urge to just keep driving. Again, Mama rallied. For her 83rd birthday on March 11, 2003, Barry and I bought Mom a trip to Georgia to visit her best friend in Atlanta. Mama missed the South the most in spring—when azaleas, dogwoods, and cherry blossoms bloomed. She flew down in April. Happily, the trip was a success. In May, Mama started going in and out of the hospital for tests for stomach problems. She was losing weight, but they couldn’t find anything wrong. Jean called in early July—Mama was confused and couldn’t stand without severe pain. X-rays found a cracked pelvis. During this hospital stay, Mama started acting delusional and paranoid. Tests found low sodium—which masquerades as dementia. They hooked her to a saline drip, limited her liquids, and gave her a high sodium diet. Mama hated it. She stopped eating, made horrible faces, and shuddered at the smell or taste of food. My best friend Tanya came up from Arkansas for my birthday in August and we spent hours trying to coax Mama into eating something. Anything! A week later she was finally diagnosed with inoperable stomach cancer. Tanya and I still feel guilty at how annoyed we were at her refusal to even try a taste of food. Mama spent the last few weeks of her life at the St. Francis nursing home facility. I was there at least twice a day, every day. She had lovely caregivers, especially a nun named Sister Carol. During my visits, Mama and I talked or I read to her. Toward the very end, I sat quietly by her bed while she slept. Stoic and queenly, Mama received a constant stream of visitors, whose cards and flowers brightened her tiny world. A week before Mom died, Joe, his wife Carol, and Ami drove up for a final visit. By this time, Mom was in so much pain that I begged her doctor to order a morphine drip. The pain pills Mom got “as needed” always took way too long to kick in. I stood in the long hallway on the phone, pleading with Dr. Kinnealey. “Do you realize that morphine will shorten her life?” Dr. K. had cared for my mother for many years, so I’m sure it was also hard for her. “Do you realize what her life is like right now?” I countered angrily. What Dr. K. said was true, Mama seemed to fade faster. She slept a lot—but no longer grimaced and writhed in pain. During their visit, Joe and Carol read long, heartfelt letters of goodbye from their three kids back in Texas. In the letters, Ashley, Reece, and Kevin all referred to “when you go.” As in, “I’ll miss you, when you go.” At the end of the reading, Carol, Joe, Ami, Barry, and I stood weeping. The Sunday evening before her death on Wednesday, it seemed like Mama had, indeed, decided not to go. A young female aid had helped Mom take a shower and shampooed her hair. When we arrived for our evening visit, Mama was standing in a fresh nightgown energetically combing her clean wet hair. She had more life than I’d seen in months. That night, Mama told Joe to go back home to Texas, to his kids. We all left that night, marveling at what we’d seen. The next morning, Joe and his family said their goodbyes and left for home. By my evening visit, Mama was back to fading in and out. Mostly, we sat quietly, but at one point she told me that she had sent Joe home because he couldn’t handle her dying as well as I could. I told her that it wasn’t exactly a picnic for me. Mama closed her eyes and sighed, and I knew that what I’d said had been hard for her to hear. Tuesday night, Mama was distracted and fidgety—her pupils as big as pennies. Morphine makes you itch, and she was scratching herself. I rubbed lotion on her arms and it seemed to help. She slept awhile and when she awoke, she smiled. She told me she had been dreaming about her Aunt Josie. At one point she looked like she was in pain. “Is something wrong?” I asked, reaching for the call button. I know she said more to me that night, but I remember those as her last words. I went home late and exhausted. The next morning, I startled awake at 10. Knowing my first appointment wasn’t until early afternoon, Barry (thinking he was doing me a favor) turned off the phone and the alarm, so I could sleep late. When I heard the increasingly urgent messages on the answering machine, I threw on my clothes and raced to the nursing home. There is speculation that some people prefer to die in private. Loved ones lament, “But I just left the room for one minute!” Others wait. Mama waited. When I got to Mom’s room, her preacher Reverend Todd was sitting beside her bed. Mama’s eyes were closed and she was taking harsh struggling breaths. With each ragged breath, there was a terrible noise—like a snore. She had been going at it for hours. She just kept struggling. Sister Carol came in and told me that earlier she had sung to Mom and it seemed to comfort her. My singing has never been known to comfort anyone, but I leaned in close. I sang Mama a lullaby that Grandma Emma-Lou had sung to me. Go to sleepy, little baby. Go to sleepy, little baby. Way down yonder in the valley. As soon as I started singing, Rev. Todd sobbed and ran from the room. Mama did calm, slightly. I talked to her. I babbled. I told her I loved her. I told her that it was okay, she could go. That she didn’t need to hold on anymore, I would be fine. I told her that I was tired. When Mama seemed less agitated, I called Barry, Jean, my friend Bonnie, and my brother. I was crying when I got hold of Joe. They were somewhere near Memphis. Joe stayed on the phone with me while I held Mama, gently rocking her. Joe said he had just talked to Reece that morning. Reece told him that he’d had a dream the night before in which he looked out the window and saw a Studebaker in the driveway. Reece said, “Grandpa was driving and Grandma was sitting in the passenger seat. They were both smiling and happy.” Reece said they waved at him, backed out of the driveway, and drove away. I held Mama for a long time, as people arrived. Bonnie came in and sat quietly in a chair. And Jean, who smiled tenderly at Mom, then reached out and gently closed her mouth. Ian, who had called Mama “Granny,” and loved her like the mother he didn’t have, stood sobbing. Oswald, another of Mom’s friends, kept saying over and over, “But I owed her lunch.” My husband arrived. My son. Someone had closed the door, so no one on the nursing staff knew she had died—so we weren’t disturbed. We sat vigil, speaking in whispers. Time stopped. And Mama had already left the room. You hear about spirits hanging around? Not Mama—she cleared out fast. I like to think that Studebaker burned rubber taking off. Finally, a nurse came in and wheels started turning. By the time people came to take her away and I took Mama’s watch off her wrist, the blood had started to pool. Like a bruise. Mama’s funeral was standing room only. Joe, Carol, and Ami made it back, and Tanya flew in. I sat next to Joe, who leaned forward in his seat and sobbed while I rubbed his back. On the altar was a beautiful picture of Mama taken when she was in her twenties. Someone had brought a single gardenia blossom floating in a bowl of water. On the cover of the bulletin was a picture a friend of Mama’s had drawn. It was a rendering of the Armistice Day dance on November 11, 1942, when Mama met the handsome soldier she later told her mama that she was going to marry. In the picture Mama wore a yellow ribbon around her neck and a red dress Grandma Emma-Lou had sewn for her. We sang old fashioned hymns—Blessed Assurance, In the Garden. Rev. Todd preached. People stood and told stories for hours. We ended with When the Saints Come Marching In. There was punch and cake in the church basement, but afterwards people flooded into our backyard. It was late when I went upstairs. I was exhausted. Looking down from my 3rd floor window, I saw Joe sitting and talking to our next door neighbor. Joe was drinking a beer and laughing. I went to bed. The next Spring I scattered Mama’s ashes on the beach at Tybee Island, Georgia. The pearl-grey plastic box that held the remains of her small war-torn body was surprisingly heavy. It was sunset and the beach was deserted. Both the sky and the warm quiet waters of the Atlantic were tinged a brilliant flamingo pink. I walked, ankle deep, along the edge of the surf, shaking her ashes into the gentle waves. Some caught like dust in the breeze and blew out to sea. Some floated like oil on top of the water—clinging to my legs as I walked—refusing to be washed away. Thank you so much, Maureen. She was gorgeous, wasn’t she! Oh my goodness, my sweet friend, from chuckles to full- on belly laugh and onward to tears flowing and back again…..can’t read….hurriedly wiping the tears to continue. So beautifully written..memories from sitting with my dad stirred. A beautiful mom and a beautiful you! Hugs as you remember your mother today and every day. Surely they still cruise in the Studebaker with smiles and pride. ?